Spring is here–supposedly. Here on the West Coast (or shall we call it the COLD coast)–it still feels like soup weather, so I decided to share a recipe for another Irish-inspired dish. 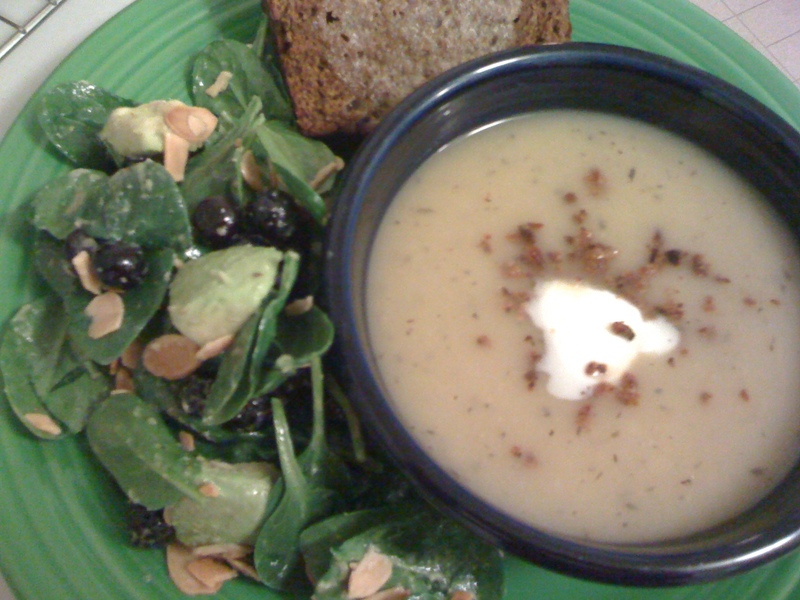 In the photograph above, I served the soup with my Brown Irish Soda Bread (for which I posted the recipe on Friday) and an avocado, blueberry, almond and spinach salad, for which I’ll post a recipe later this week. In a large saucepan over medium-low heat, sauté leeks in olive oil until translucent but not brown, about 7 minutes. Add vermouth and stock, thyme and potatoes, and simmer for 20 minutes, or until potatoes are tender. Transfer to a blender or food processor and purée. Season with salt and pepper to taste. Garnish with sour cream (or crème fraîche) and bacon crumbles, and serve. Tina’s Tip: To cut down on steps–and extra dishes–I use an immersion blender to purée the soup right in the saucepan. Recipe adapted from The Irish Isle. This entry was posted in Recipes, Soups and tagged Gluten-free, Potatoes, Soup, Vegetarian-optional. Bookmark the permalink.